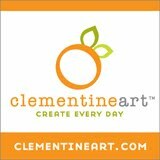 I recently discovered a great local website about food, called CT Bites. It's been around for awhile, but somehow it took me way too long to find it. 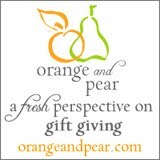 Now that I have, I've been checking it out daily...finding tons of tips & great food finds in my area...Fairfield County, CT. 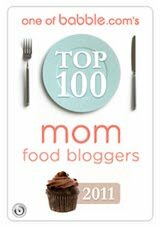 Recently, they had a post with some recipes from Nicole Straight, a chef, who runs cooking classes around these parts. 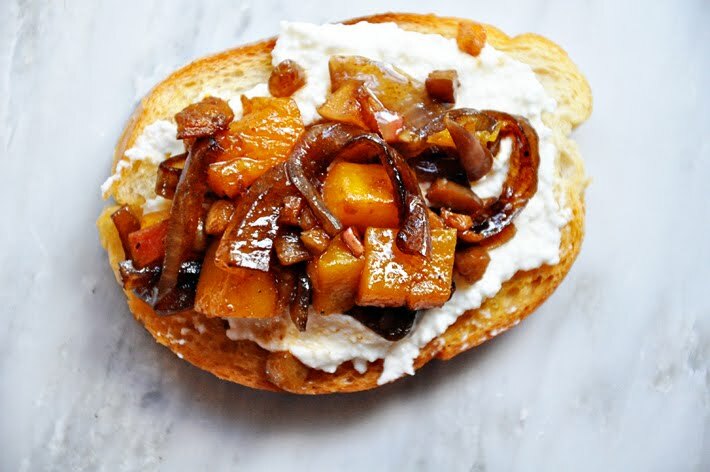 One of the recipes was for this Fall Bruschetta, which I immediately knew I wanted to try. I ended up making it for some friends who came by after our Pumpkin Picking afternoon last week. I especially loved that everything could be made ahead of time...something that has become a requirement in my super busy weekend schedule...which, sometimes includes jamming 4-6 hockey games into 2 days. I adapted a couple of things...mainly, just adding measurements to some of the ingredients. I also added some ricotta cheese as a base to the bruschetta, partly to make it a bit more hardy...but, also because I thought it would taste really good with it. 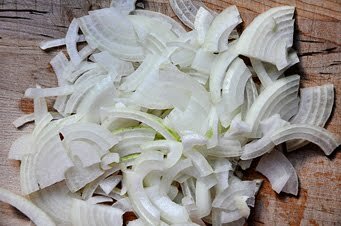 Next, quarter & thinly slice an onion. Heat 1 tablespoon of olive oil in a non-stick skillet & add the onions. Along, with a 1/4 cup balsamic vinegar & 2 tablespoons of agave nectar. 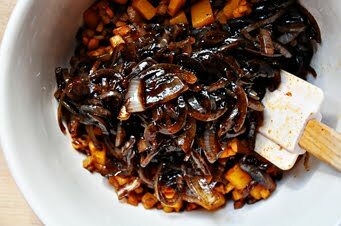 Cook until the onions are softened & all the liquid is absorbed. Set aside. 1 tablespoon olive oil & 1 teaspoon of paprika. Season with salt & pepper. 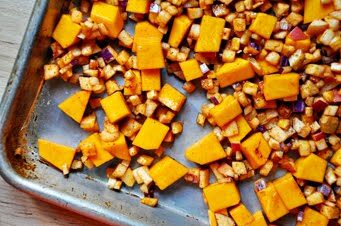 Spread the mixture out on a baking sheet & bake for 20-25 minutes, tossing halfway through the cooking time, until the squash is just tender. Transfer to a mixing bowl & add the onions. Toss well. Check for seasoning & add a bit more salt & pepper, if needed. 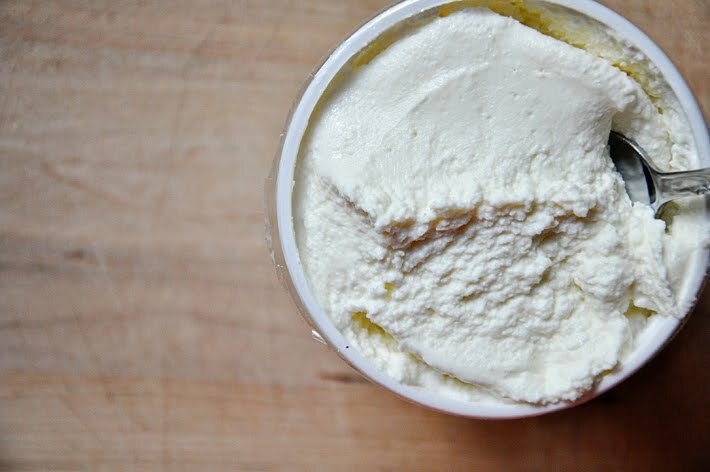 To assemble you will need about 1 cup of ricotta cheese. 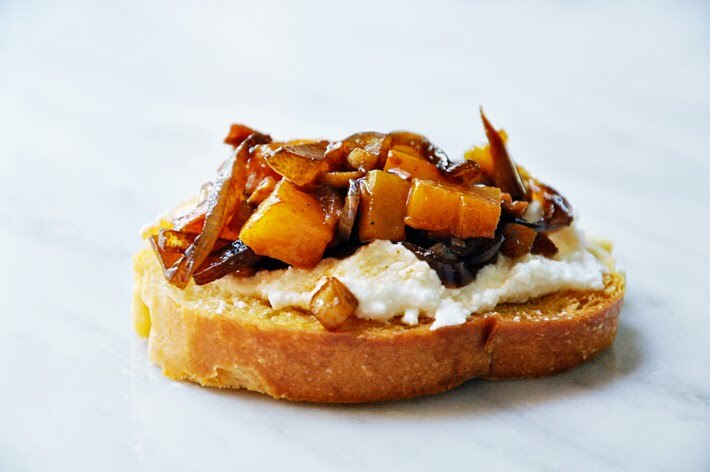 Spread a bit of the ricotta over each toast, then spoon some of the bruschetta on top. Transfer to a serving platter & serve. Preheat the oven to 400 degrees. 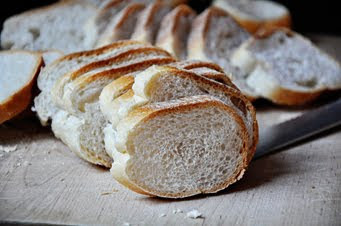 Slice the baguette into 1/2" slices & lay them out on a baking sheet. You can use more than one baking sheet, or make these in batches. 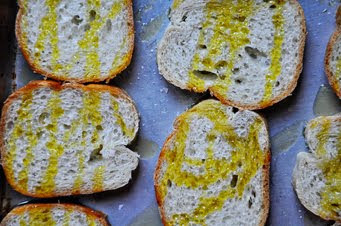 Drizzle the bread slices with some olive oil & bake for about 5 minutes per side, or until lightly browned. Set aside. 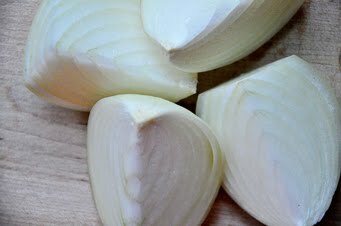 Quarter & thinly slice the onion. Heat 1 tablespoon of olive oil in a non-stick skillet. 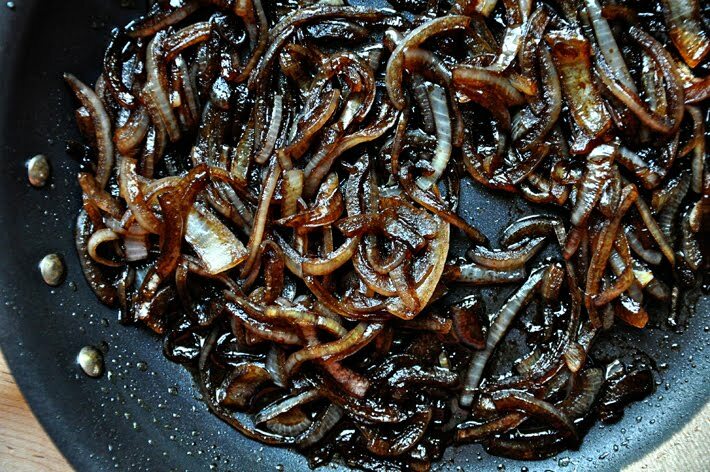 Add the onions, balsamic vinegar & agave. Cook until the onions are softened & all the liquid is absorbed. Set aside. Preheat the oven to 425 degrees. 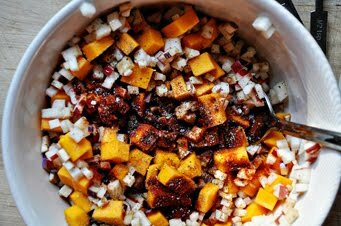 In a mixing bowl, toss the butternut squash, eggplant, apple, 1 tablespoon olive oil & paprika. Season with salt & pepper. 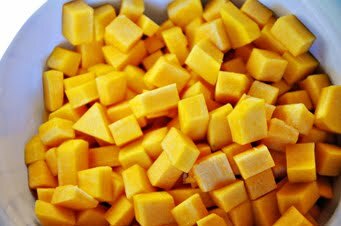 Spread the mixture out on a baking sheet & bake for 20-25 minutes, tossing halfway through the cooking time, until the squash is just tender. To assemble, spread a bit of ricotta cheese over each toast, then spoon some of the bruschetta on top. Transfer to a serving platter & serve. Note: The bruschetta & toasts can be made ahead of time, stored in separate air tight containers, for up to 2 days. This looks delicious...Can't wait for the weather to get autumnal again so I can give this a try. This looks really tasty. 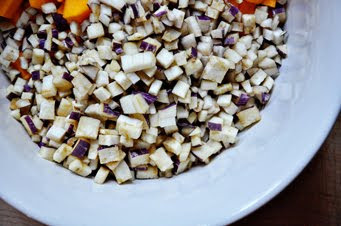 What a great combination - butternut squash, eggplant, and apples! 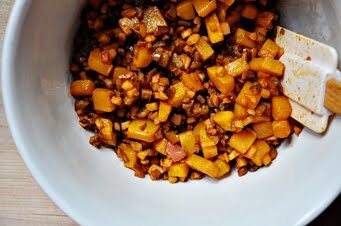 This reminds me of a butternut squash and morel chutney that I made last year. But with an Italian rather than an Indian twist. Love it. 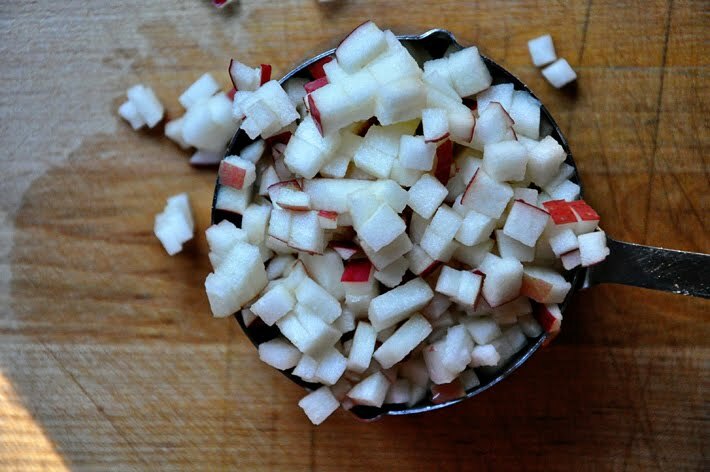 This would be awesome on a huge crusty piece of ciabatta. Did you served this warm? Do you think room temp. is okay? If I had the time, I would have let it come up to room temp. before serving. But, the day I served it I didn't have time to do that...so, I microwaved it, just enough so that it was not cold from the fridge. It could also be served warm too. Just not hot, or it will melt the cheese too much. I had a different recipe planned for an autumnal gathering this week - I think this may just have taken over! wow. delicious and brilliant. my husband and i just ate this meal and we.are.satisfied. thanks for sharing. Thank you for sharing Katie! This recipe was a hit at a Halloween get-together. Delicious! I've eaten at noon and it was delicious. Thanks for the recipe! Hey lovely! I just wanted you to know that I made these for a potluck this past weekend and they were definitely the hit of all the dishes that were there! Thanks girl, love ya! i bet adding dates and some bacon would just tip it over the edge of deliciousness! i usually make bacon wrapped dates with ricotta stuffing for appetizers, but may make this instead for thanksgiving...with the addition of the bacon and dates of course! thanks for the recipe!